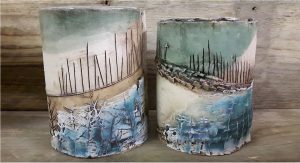 The continually changing landscape fascinates me and has become the main influence behind my drawings and sculptural pieces. I am obsessed with how human touch has always had a huge impact on the world around us. Now, in urban life, we are surrounded by a new landscape where streetlights and signposts, chimneys and aerials have replaced the trees and rock forms of a more natural setting. 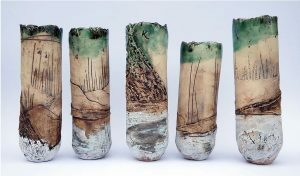 I use ceramic structures to create my own landscape of forms. Shying away from heavy glazing use oxides and stains to colour my work. I love the raw, urban look that these give to my pieces. They highlight the textural and linear nature of the relief and celebrate the earthy properties of the material. Coffee, tea and biscuits will be available on the day. Please bring a contribution to an American Supper style lunch, as well as your own crockery and cutlery.